Like a game of telephone (aka Chinese Whispers), the New York Post attributed their marijuana overdose story to the Reno Gazette Journal, which itself was a copy of a report from KUSA Denver. 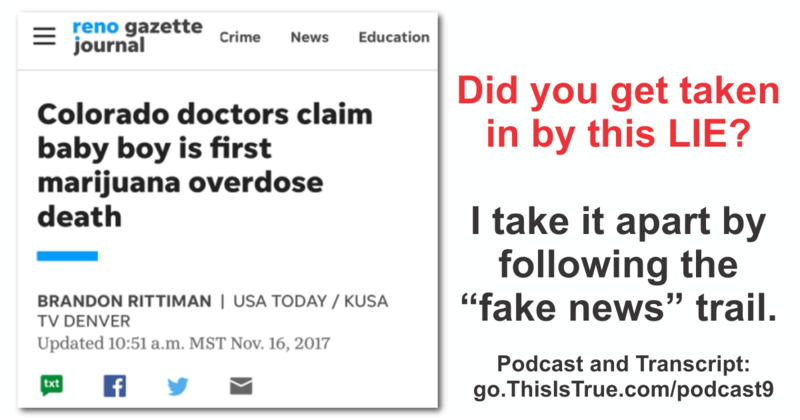 Newsweek gets it wrong too: the “FDA” report they touted actually links to a DEA Fact Sheet that’s no longer online, but admitted there haven’t been any marijuana overdose deaths. And that’s still true. But the CDC’s report documents that alcohol causes 88,000 deaths per year, backed up by an NHTSA report showing that drunk drivers are much more likely to be in crashes than pot smokers. So the real problem is…? We’re fighting the wrong battle (as per usual). And this from a guy who has no interest whatever in pot, and who does (occasionally) drink. There’s a lot of talk about accuracy in the media these days, up to and including frequent accusations that the mainstream press publishes “fake news.” For the most part, I don’t think that’s true, but that doesn’t mean people who watch TV or read news online don’t have to be intelligent consumers of news, especially when it comes to medical or scientific topics. Or, to put it another way, we need to exercise Uncommon Sense as a filter on the news, and this episode has an example of why. One of the facts that marijuana legalization proponents like to point out is that even the federal Drug Enforcement Administration admits there’s never been a single documented death from a marijuana overdose. So when a medical case report published in the journal Clinical Practice and Cases in Emergency Medicine noted that a child had died in a case “associated” with cannabis in Colorado, where marijuana is legal, headlines blared that the “first marijuana overdose death” had been recorded. Nope. First, the boy was not any sort of pot “user” — he was just 11 months old, and lived in a hotel room with his parents, who admitted they had marijuana when a blood test on the boy found THC, presumably from second-hand smoke. 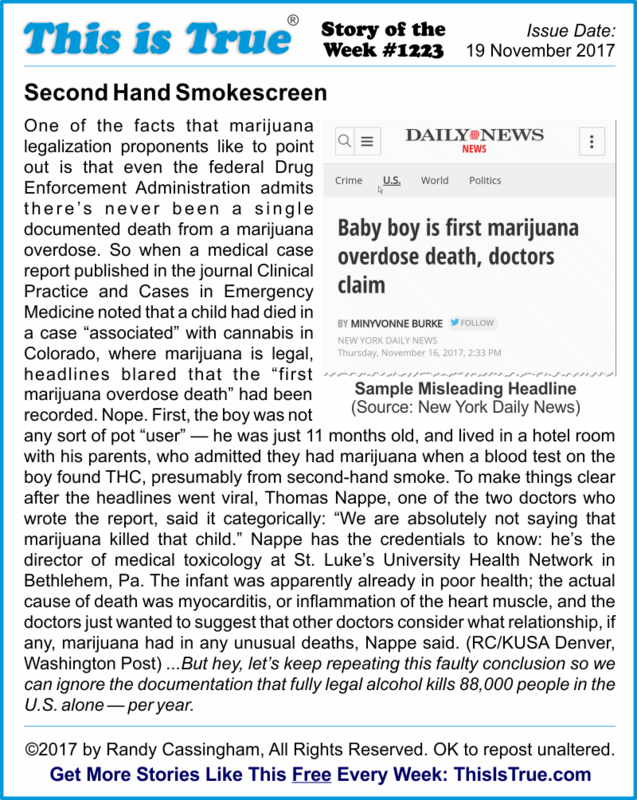 To make things clear after the headlines went viral, Thomas Nappe, one of the two doctors who wrote the report, said it categorically: “We are absolutely not saying that marijuana killed that child.” Nappe has the credentials to know: he’s the director of medical toxicology at St. Luke’s University Health Network in Bethlehem, Pa. The infant was apparently already in poor health; the actual cause of death was myocarditis, or inflammation of the heart muscle, and the doctors just wanted to suggest that other doctors consider what relationship, if any, marijuana had in any unusual deaths, Nappe said. I skim a number of news sources every week to gather stories for This is True, and I kept seeing that headline again and again. Here’s some examples. USA Today headlined it, “Colorado doctors claim baby boy is first marijuana overdose death”. Newsweek’s headline: “Can You Overdose on Marijuana? Baby Becomes First Ever Death from Ingesting Too Much Cannabis, Doctors Claim”. 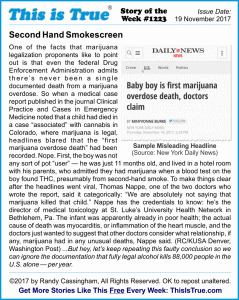 And the one that I used to illustrate the story on the Show Page, from the New York Daily News, “Baby boy is first marijuana overdose death, doctors claim”. The two doctors who wrote the case report in the medical journal — and let’s be clear: a case report is definitely not a study of any kind, just a report — are based at the Rocky Mountain Poison and Drug Center here in Colorado. So here’s the thing that really bothers me about this chain of stories that led to all these headlines. The New York Post gave its source as …the Reno Gazette Journal. Does that newspaper in Nevada have reporters in Denver? Nope: their story — I went and looked — was actually a reprint of a story by KUSA TV in Denver. So why did the New York Post mention the Reno newspaper at all? Why didn’t they just go to KUSA TV’s web site, where I found the story, and get the report directly from them? Not that they necessarily got it right either, but it would avoid the “telephone game” of the original story being interpreted by a newspaper and then that being reinterpreted by another newspaper, and so on, and so on, echoing the erroneous headline again and again. Now Newsweek’s report at least said the doctors’ “conclusions are controversial,” and they did pull some quotes from KUSA TV in Denver. But what exactly was the conclusion the two doctors actually put in their medical journal case report? I looked it up: “We believe there exists a plausible relationship that justifies further research into cannabis-associated cardiotoxicity.” That’s it: it’s plausible that there could be something that justifies further research, and certainly not a conclusion even close to “We have proof of the first overdose death from pot.” Yet that’s exactly what the headlines said. Sensationalistic attention-getting make the headlines lies. Here’s something else that Newsweek has in its article that’s still online, I looked at it before recording. It says, “No death from a pot overdose has ever been reported, according to the FDA.” — the FDA is the federal Food and Drug Administration. They link that word “FDA” to the actual report from the DEA — the federal Drug Enforcement Administration, a totally different federal agency, and its so-called “drug data sheet” on marijuana, which, yes, clearly states it very succinctly, “No death from overdose of marijuana has been reported.” But what sloppy reporting from Newsweek on what would be an important story, if only it was true. They can’t even get the federal agencies right! So if you’re using your Uncommon Sense filter right now, you might ask: where did my tagline’s claim come from, that there are 88,000 alcohol deaths every year? Those are shocking numbers. And that’s just deaths. That doesn’t even count the wreckage that they’re causing before they die: the car crashes, the DUI arrests, the child neglect. Now, I do use a little bit of alcohol myself, on average a drink or two per week, so I’m not some temperance lecturer here. And while I did vote for Colorado to become the first state to legalize recreational marijuana, because I believe adults should have the choice whether to use it, I’ve exercised my now-legal choice myself — and my choice was to not use it: I’ve never used pot, not even once, before or after it became legal. But, if I was getting chemo for cancer, and it helped with pain or helped keep my appetite up to help me fight off the disease? You bet I’d use it, and everyone deserves that choice. Now some people think marijuana should be illegal because of impaired driving. It is true that smoking pot before driving increases the odds of crashing by 83%, which sounds pretty shocking …until you compare that to a blood-alcohol level of just .05%, not even the .08% that’s the threshold for drunk driving. .05% increases the odds of crashing by 675%. Now, where did I get that? The National Highway Traffic Safety Administration. I’ll link to that report on the Show Page too. Now, I can get more and more reports and quote more and more statistics, but I think the point is made: we can totally misinterpret a minor medical case report, and scream headlines about the dangers of pot, but they’re easily disproved even with government statistics. And when you compare those statistics with alcohol, which is legal, and it’s clear that drug — and yes, alcohol is a drug — is far worse that pot, why, again, are we spending tax money to put drug users in prison? Ask any cop who he or she would rather fight to bring into custody: a drunk, or a pot smoker. Not one cop I’ve asked that question of has ever, not once, chosen “a drunk”! They know drunks are far more violent. I’ve had to have cops back me up on medical calls when we have a drunk there. But pot? Never. They’re just totally mellow. And yeah, too much mellow can get you into a car crash, but nothing like a drunk driver. So as we often do in this country, we’re fighting the wrong battle. And the media isn’t helping. They hear “baby dies” and “THC in its blood” and come up with a completely erroneous conclusion, and pound it again and again and again, so no wonder people get the wrong idea. But hey, the online model is so-called “clickbait” — they have to get “eyeballs” to their stories to show traffic to sell ads on their web sites, and that gives incentive to get traffic, where before the goal was to be accurate. The story I’m discussing is fairly long by This is True standards: about 250 words. And even though I’m covering that “in more depth” here, there’s still a lot more in KUSA’s version of the story, like cautioning that the doctors’ thoughts were “controversial” and giving quote, “Some important context and advice.” And the main advice was lock your stash up, don’t let your kids get anywhere near it. C’mon! But, the headline writers didn’t seem to pay any attention to that. They wanted to trumpet that B.S., clickbaity headline. And really, this was not “fake news,” this was actually a legitimate article in mainstream news sources; it was mostly the headline that was wrong. Yet, how many people read past the headline? Yet that conclusion was completely untrue. And I see this a lot: one publication will say another one reported something. And when you go to that other publication, you’ll find that they are actually quoting some other publication, which is giving their own interpretation of something that was published in a scientific journal. Even actual studies need backups and confirmations before science accepts their conclusions, but the news media typically ignores that, and runs with a story in an effort to be first to report something. And in this case, it wasn’t even a study. So there are two situations where you should be dubious of news reports: when something seems too wild to be true is one of them. The other is even harder: when a report confirms something you believe. That’s the biggest risk of them all: confirmation bias. When a publication says something that vindicates something you believe, you owe it to intellectual honesty to go to their source, and see what they actually said. And if they are quoting another publication, look at that source, and their source, and so on until you get to the start of the thread and see: do they say their results are conclusive, and without error? 999 times out of 1,000 I’ll bet it doesn’t, and the other one is probably lying. Just something to think about. That’s what someone with Uncommon Sense would do. Just a quick note to point out that Uncommon Sense does not have advertising — and either does the This is True web site. This is True and Uncommon Sense are reader and listener supported. 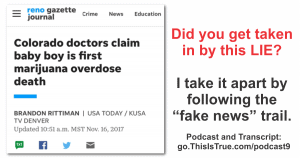 When you check out the Show Notes for this episode at thisistrue.com/podcast 9, consider clicking the Contribute button in the sidebar: that’s how the newsletter and this podcast keep going. And I’ll talk at you later. Most likely his parents were so doped up they didn’t notice the baby was sick. In my opinion its no different than the kids who are neglected when their parents abuse alcohol. To be fair, if the cause of death is neglect because the parents were under the influence, then it is a marijuana related death. The article suggests but does not say that is the case. While neglect due to drugs is a side effect we must address, we truly have our priorities out when we fail to address the more egregious versions — alcohol and other drugs — which cause more direct deaths. When however have we ever worried about statistics? We as a country focus where advertisers tell us to. It is too easy to make us forget a subject by posting too many articles — so we quit reading them. Great Podcast. Interesting and timely subject. There was no doubt you were both having fun. A few months ago, I spoke at my local Planning Commission when it discussed relaxing marijuana regulations. The anti-marijuana, pro-alcohol public was making the same arguments about marijuana that would be just as valid if they’d said “alcohol” instead. I expressed my frustration that marijuana seems to be perceived as “the wrong drug”. As soon as I said that, there was a sudden air of “Oh, no he di’int!” I think the Commission was ultimately hung and the City Council somewhat relaxed regulations, but not quite as much as I’d hoped. What really made this special: this was in wine country! For loads of insight relating to this and related topics, just google “graphs of unrelated things” and you could really have some fun. Thanks for the reference to Spurious Correlations. It gives me something to cite besides the correlation between shoe size and literacy. I have to agree with your main points about reporting. The speed of the internet seems to induce a compulsion to “publish” fast, which reduces the tendencies for proofreading and editorial review, and exacerbates the tendency to feel that if you cite another news agency, you don’t have to do due diligence. And even the people commenting here tend to jump to conclusions (e.g. the parents were high and ignored the baby’s distress). Another factor, perhaps — the headline doesn’t necessarily reflect the actual content of the story. I even emailed an author at Ars Technica about this, and she agreed, but said she didn’t write the headline. I’ve also seen a couple of NY Times headlines which got Supreme Court rulings wrong; in one case the story itself exposed that; in another, the ruling itself (available on line) indicated they were oversimplifying. And, of course, headline writers (and link writers) are, as you say, after eyeballs. I can’t tell you how often I’ve clicked on a link only to find that the linked story has a completely different title. Since I’ve just read the Washington Post story “‘Nothing on this page is real’: How lies become truth in online America”, it would seem this is a relatively trivial issue compared to the rampant acceptance of completely counter-factual narratives, but for those of us who value accuracy, it is indeed frustrating. As you say, even generally trustworthy sources occasionally get it wrong (although I don’t rank any of the sources you mention, including Newsweek, in that category — at least not to the point of committing the time to read them). My friend, a long-time occasional MJ user, asked me, a never-user, if I would rather see a drunk speed through a red light, or see a “high” user sitting at a stop sign, waiting for it to turn green? I think this simplifies it too much, but it does show a contrast. So much of this story is beautiful that I can’t justify taking that much space to comment on specifics. I live in Texas where pot is still illegal but when it becomes legal I won’t use it except for medical reasons, which I don’t currently have. I don’t consume alcohol in any form but I remember that Prohibition led to organized crime. I believe in personal responsibility and adult choice. I personally think that any drug use is unwise, but if a person could buy, say, heroin at a pharmacy, with the needles etc., there would be much less overdose, transmission of disease, and other dysfunctions. And less abuse by minors. It’s easy for a kid to buy drugs, not so easy to buy alcohol. Many purveyors of “news” do not transmit facts. They are in business to sell advertising. A lot of the time it is a lack of understanding of the topic by a reporter or the editor that causes false news when a vital paragraph is edited out or shortened to fit the space on the page. This resulted in an article my dad submitted to a paper 50+ years ago. He steadfastly refused any requests for articles ever after. The fact that other papers compound the misinformation by sensationalizing it is deplorable. I occasionally send emails to authors/editors/info@website just to find out what exactly they meant to say since there was something intensely obliviotic about the article they piqued my interest with. I have managed to avoid doing that with the streamers the TV morning news trails across the bottom of the screen though I often nearly choke on my morning coffee. I try to believe it is finger trouble but I wish someone at the station could correct it before the evening news especially when it persists to the next day. Posting invalid headlies (now that is a good mispelling of headlines so I will leave it in) on purpose is sometimes verging on sinful/criminal/obliviot.